More than 200 law enforcement agents and officers from across the state of Texas - including from the Katy area - spent two days this week attending an officer safety training conference sponsored by the Department of Justice. The training program is entitled Preventing Violence Against Law Enforcement and Ensuring Officer Resilience and Survivability, or VALOR. U.S. Attorney Kenneth Magidson said the training was designed to ensure local officers have the latest information available to deal with critical events, particularly those that put the lives of law enforcement officers in immediate danger. "As recent events have shown, each day federal, state and local law enforcement must work together to ensure that our communities are safe - and that they are safe while carrying out their duties," Magidson said. "It is our job to provide to them all the tools necessary to promote the safe execution of those duties." 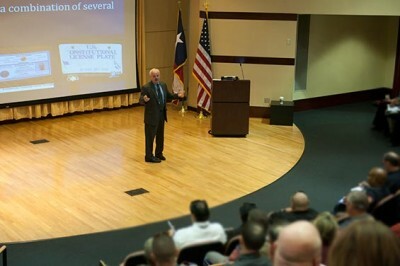 The program included presentations by Magidson, as well as experts from the Travis County, Texas, Sheriff's Office, police departments in Hot Springs, Ark., and Los Angeles, Calif., the Advanced Law Enforcement Rapid Response Training Program, State and Local Anti-Terrorism Training Program and private companies. The two-day conference was held at the University of Houston-Downtown, which sponsored the event along with the United States Attorney's Office. "We are honored to host this timely, important conference that further equips officers across Texas to keep themselves and our communities safe," said William Flores, Ph.D., UHD president. The VALOR initiative offers a national response to emerging trends and aims to help law enforcement agencies adequately prepare officers for the threats they face while on duty. The goal is to reduce violence against law enforcement and improve officer survivability. VALOR enables the entire U.S. law enforcement community to have access to and benefit from the latest expertise, analysis, tactics, interdiction techniques and response methods to address this critical problem and to reduce the number of officer fatalities. That goal is achieved through ongoing identification of emerging criminal threats, the development and delivery of knowledge and skills-based training to effectively address those threats as well as the promotion of attentive vigilance among law enforcement to proactively assess ever-changing circumstances. The long-term officer safety initiative includes the comprehensive and multifaceted training program which is supported by data collection and analysis, policy development support and technical assistance. VALOR is designed to reach thousands of officers and law enforcement managers and policymakers through in-person (classroom and hands-on) and distance-learning efforts, resources and publications and technical assistance. The VALOR training presented this week was designed for front-line law enforcement to promote officer safety and help prevent injuries and deaths to law enforcement officers in the line of duty. In the training, participants gain an understanding of emerging threats, including those posed by antigovernment criminal extremists and learn techniques for anticipating and surviving a violent encounter. Officers also learned how to identify concealed weapons and armed gunmen, gain knowledge of the mental and physical skills required for high-risk tactical situations that may involve active shooters, high-risk tactical considerations, specific threat groups and violent criminals as well as an understanding of the importance of self-aid/buddy-aid training. The Department of Justice initiated the VALOR program in 2011. Since that time, the United States Attorney's Office - Southern District of Texas has held six meetings with law enforcement executives throughout the district in addition to this week's conference.